Hello Artwork was founded in 2012 with the dream to bring inspired art prints to people across the world. From our studio we have grown hugely over the past couple of years, but the same care and attention to detail is still paid to every single piece we create. Each and every piece is printed to the highest standards onto Museum Quality canvas, and then stretched by hand across a solid timber frame ensuring the original character of the piece is represented. Our Commitment - We believe that our online gallery offers an excellent alternative to traditional gallery outlets for art. Central to this is our commitment to customer service - we aim to respond to queries and orders within 24 hours and helpfully, and so make the experience of buying art an easy and enjoyable one. 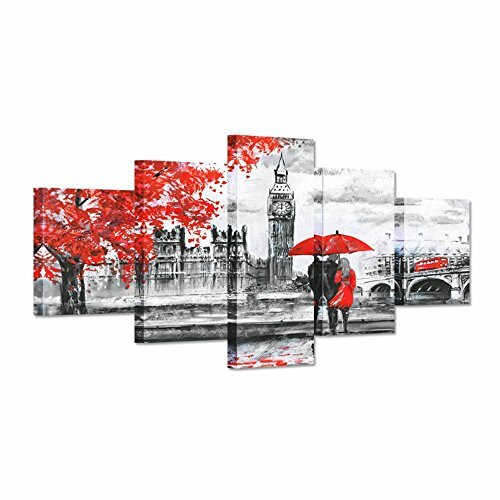 The canvas is digitally printed using the latest printing equipments for fine art reproductions. Our product's quality is high, the materials used are environmentally friendly and each product is made by hand. The inks used in our prints are certified to comply with the Environmental Standard. Our inks are friendly, with a very high durability, all wastes being responsibly disposed of. All monitors register color differently. Every effort is made to ensure accurate rendering of artwork; however, there may be some difference due to the technology. If you have any questions about this product by Hello Artwork, contact us by completing and submitting the form below. If you are looking for a specif part number, please include it with your message. Onepiece Huge Modern Abstract Giclee canvas Print For Office Home Wall Decor with An Easy DIY Giant Art Stretcher 84 X 84"
Black and White Abstract Canvas Print, 24" x 36"
Abstract Black, Silver, Pink Canvas Print, 24" x 36"